Objective: Robotic-assisted laparoscopic surgery has recently received enthusiasm for application in colorectal resections involving the pelvis. 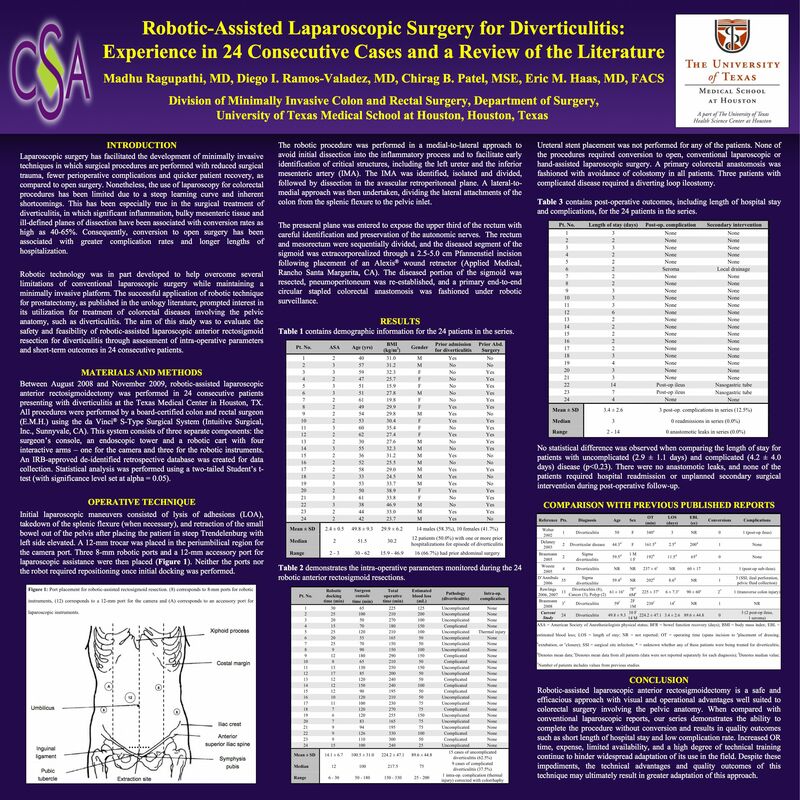 We present the feasibility and safety of using the da Vinci® surgical robotic system for the treatment of sigmoid diverticulitis requiring anterior rectosigmoid resection with primary anastomosis. Methods and Procedures: Between August 2008 and September 2009, robotic-assisted laparoscopic rectosigmoid resection was performed for 19 consecutive patients with diverticulitis. Demographic information (age, body mass index (BMI), gender, disease stratification), operative parameters (docking time (DT), surgeon console time (SCT), total operative time (TOT)), and post-surgical outcomes (length of hospital stay (LOS) and complications) were assessed. Results: The preoperative diagnosis for all patients was recurrent sigmoid diverticulitis (n = 19). Elective rectosigmoid resections were performed for 11 male (57.9%) and 8 female (42.1%) patients. Mean age was 50.8 ± 9.4 (range: 30-62) and BMI was 28.4 ± 4.7 kg/m2 (range: 15.9-35.4 kg/m2). Disease stratification identified 12 cases of uncomplicated (63.2%) and 7 cases of complicated (36.8%) diverticulitis. All complicated cases were classified as either Hinchey stage I or II disease. The procedures required 15.2 ± 7.0 min (range: 6-30 min) for DT, 100.0 ± 34.2 min (range: 50-180 min) for SCT, and 218.4 ± 40.0 min (range: 150-290) for TOT. The DT and SCT represented 7.4% and 45.8% of TOT, respectively. The LOS was 2.6 ± 1.0 days (range: 2-6 days). One case required a diverting ileostomy secondary to severe acute inflammation associated with a pelvic abscess and an enterocolic fistula. No intraoperative complications were encountered and none of the procedures required conversion to conventional laparoscopic or open surgery. The overall complication rate was 5.3% during post-operative follow-up. None of the patients required hospital readmission or secondary intervention during post-operative follow-up. Conclusion: The results of this series demonstrate the technical feasibility, safety and favorable short-term outcomes of using the da Vinci® robotic system for the surgical treatment of diverticulitis.